NRAMM is located at the Simons Electron Microscopy Center at the New York Structural Biology Center. The NYSBC main office and SEMC are at 89 Convent Avenue at 133rd Street (on the southern end of the campus of City College of NY). Take the express A or D lines, or the local lines C and B to the 125th Street stop. Walk one block west to Morningside Avenue. 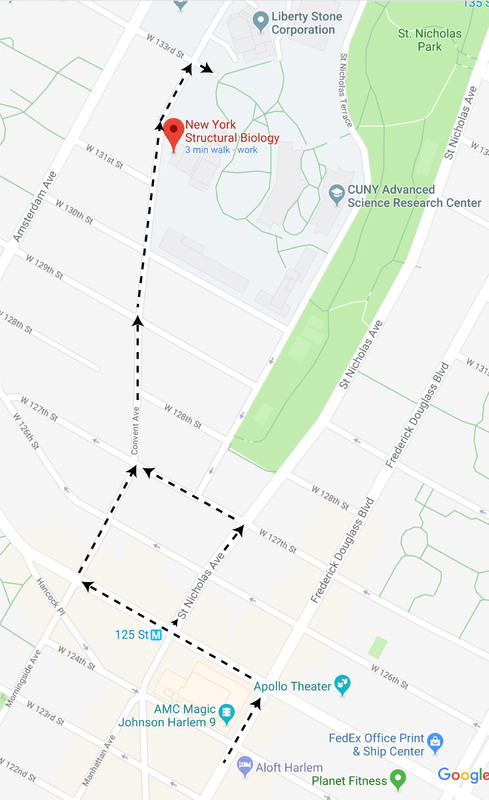 Turn right and walk eight blocks north (Morningside Avenue turns into Convent Avenue at 127th Street) to 133rd Street. Continue through the gate and across the parking lot into our facility. Please sign in at the security guard desk. Take the 1 line to the 137th Street stop. Walk four blocks south to 133rd Street. Turn left and walk two blocks east to Convent Avenue. Continue through the gate and across the parking lot into our facility. Please sign in at the security guard desk. Take the Westside Highway to the 125th Street exit. Drive north on 12th Avenue to 133rd Street and turn East to Convent Avenue. NYSBC is inside the parking lot at the corner of 133rd Street and Convent Avenue. Continue through the gate and across the parking lot into our facility; for a parking pass, please sign in at the security guard desk and request one. If the guard outside of the parking lot stops you, tell them you are going to the New York Structural Biology Center and will pick up your parking pass there.